Are car companies putting profits ahead of people? Cars and light trucks today have more safety features than ever thanks to tougher federal regulations and carmakers' innovations. 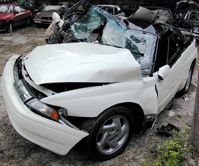 Hundreds of thousands of people owe their lives to seat belts, airbags and anti-lock brakes and other sophisticated electronic systems. Indeed, the nation's highway accident rate is at its lowest level ever. But critics note that more than 41,000 people still die every year in motor vehicle accidents and that the spate of recent fatalities linked to the Ford Explorer and Firestone tires indicates that automakers are still shortchanging the public on safety. They say Detroit should be held to much more stringent manufacturing, performance and defect-reporting standards. But manufacturers contend safety actually will suffer if ill-conceived or superfluous government regulations are implemented.